Western connoisseurs who collected Chinese ceramics at the turn of the century knew relatively little about earlier wares. Since the meticulously formed and decorated Qing dynasty porcelains were generally regarded as the culminating achievement of a centuries-old tradition, it was assumed that the earlier wares must be more heavily potted and glazed. 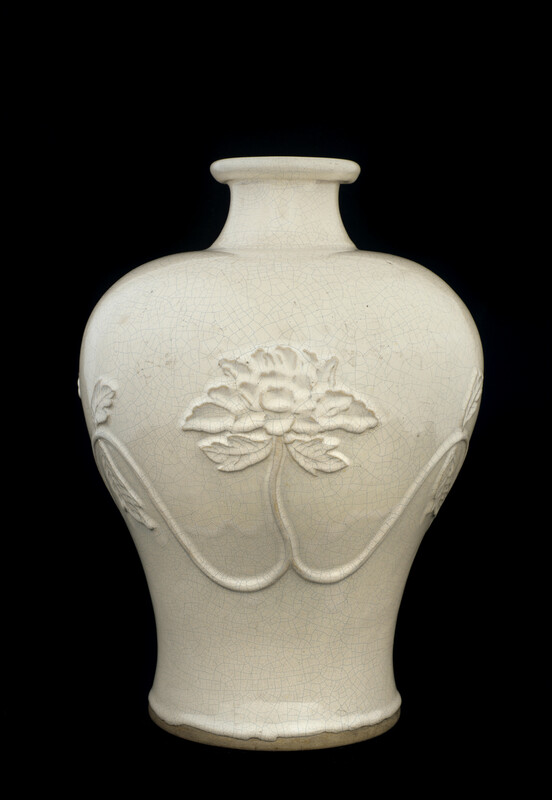 Thus, when Freer purchased this jar in 1894, he accepted the Song dynasty date assigned to it. However, its robust shape, lustrous glaze, and bold floral decoration are characteristic of the Shiwan wares made in Guangdong province during the late Ming and Qing dynasties. This vase is an especially fine example of Shiwan ware, and its quality helps explain why both Chinese and Western collectors originally valued such objects so highly. "Vase with relief design of peony scroll," in The Peacock Room, Freer Gallery of Art, Smithsonian Institution, Accession No. F1894.3a-b, Item #3188, http://www.peacockroom.wayne.edu/items/show/3188 (accessed April 19, 2019).